Iâ€™ve received several questions recently regarding the use of thick handled dumbbells.Â Many have asked where to find such handles, and others have asked why it makes sense to use a thick handle. Personally, I prefer building my own dumbbell handles.Â For a few dollars, you can build yourself a fully functional (and strong) handle.Â Â If you prefer to buy a â€œprofessionallyâ€ constructed thick handle, be prepared to fork over some serious cash.Â A quick search of the market brought about several expensive handles, with some even surpassing the hundred dollar mark. Before building or buying, itâ€™s first useful to know what is in it for you.Â Why bother building or buying a thick handled dumbbell? 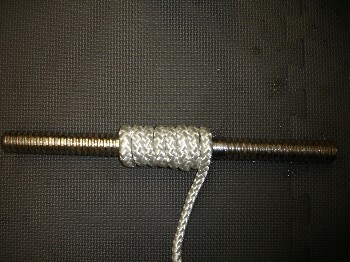 Thick handle lifting was very common in past generations, and is starting to make a comeback in the modern era.Â The renewed popularity shouldnâ€™t come as a surprise, particularly when you consider the almost instant benefits associated with such handles.Â Thick handle lifting will quickly strengthen the forearms and grip.Â Â Such handles will enhance the difficulty of almost any lift. 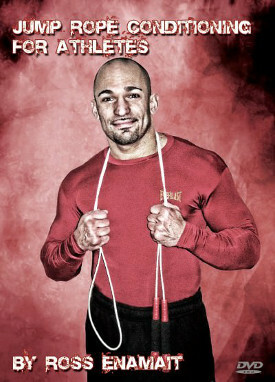 Iâ€™ve lifted with thick handles for several years now, and will continue to do so.Â Â These handles have made a huge difference in my hands.Â As many who read this site are aware, I had hand problems for many years as a young fighter, so Iâ€™m always looking for ways to strengthen the hands.Â Thick handles have become a favorite of mine. 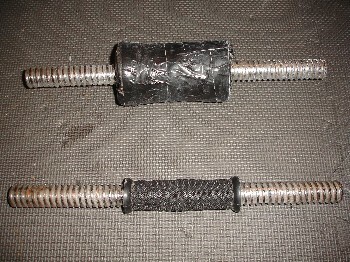 There are several options for thick handled dumbbells.Â Â Perhaps the easiest methods are the use of duct tape or foam pipe insulation.Â With duct tape, you can add a little at a time, to gradually thicken one of your handles.Â Another option involves wrapping your dumbbell handle with foam pipe insulation.Â Look for foam that is at least somewhat rigid, so it maintains it shape.Â You can then wrap the foam with duct tape if you wish (to keep it in place). 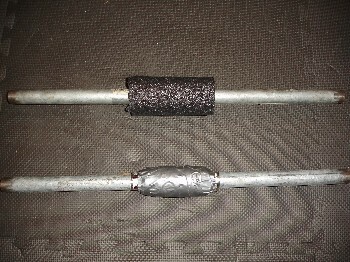 The picture below shows each of these options.Â Both handles were constructed from galvanized iron pipe (purchased at Home Depot for a few dollars each). Next, you can see how the handle looks with a second layer of rope.Â You can also see the handle before and after it was altered.Â Â This handle was one of the inexpensive spin collar handles sold at Walmart for a few dollars. It is worth noting that I’m not a huge fan of these Walmart handles (particularly the collars).Â I much prefer a fully homemade handle, using the galvanized iron pipe method seen above. Thick handle dumbbells can be used for almost any traditional dumbbell lift.Â Heavy rows and farmerâ€™s walks are two of my favorites.Â You can however use these handles for other (more conventional lifts) such as dumbbell swings, various overhead presses, Zottman curls, etc. I am not suggesting that you perform all of your work with thick handles, but these handles do make a nice addition to a complete strength program.Â I will often start with a traditional handle (where I can go heavier), and then switch to a thicker handle with less weight (within the same workout).Â I mix and match conventional and thick handles within the workout.Â Another option is to perform a traditional strength workout, and close with a thick handle finisher (ex. a few sets of farmer’s walks with the thick handles). People this man is correct as always. Ross i heeded this advice along time ago when i purchased (II) Since i’ve been doing hand training & my hands have definitley gotten stronger, & definitley no more pain in my hands. I have to admit for years i never did hand training until i came across the (II) manual, as always all of your work is just without a doubt the greatest stuff any athlete could ever come across on this earth. All of your material is wonderful but i have to admit there is just something about that (II) manual Ross. I love the S**T outta that book man. Please, Please, Please, i’m praying that you come out with some new material. Another dvd would be off the hook!!! After getting them and using them, I definitely felt the work in my grip and forearms, big time! It has been a great addition to my workout equipment. What I did was just cut a piece of PVC pipe roughly the size of the grip area and just let the plates keep it togather. Great post Ross. Another quick option we’ve used is wearing thick gloves when training. It makes everything a grip challenge. I divide my workouts between a commercial gym, my home gym and the jungle gym at a local park. When I am at the commercial gym, I use a small gym towel to reproduce the Fat Bar effect. I have also used a piece of foam pipe insulation that I split lengthwise. BTW, I am new to your blog and I am very impressed. I signed up for the feed. Welcome DR were all here for you man. Any questions feel free to ask any of us or e-mail the king himself Ross Enamait.